Troublemekka and Jesse I present a night of bruk out Jamaican dancehall, bashment and jump up soca at the Laundry Bar. Running bi-monthly, Yard Bounce will feature the finest selectors, MCs and dancers in the business. Get ready for the vibes to tun up Caribbean-style this summer. The first instalment will feature hosts Troublemekka and Jesse I alongside guest DJs Sista Itations (Pressure Drop), Zare Demus (Australia Reggae Radio) and Al Good (Pull Up Selector). Amac Don and Slicker 1 will be touching the mic and the Burn-City Queenz dancers will be representing with the freshest dance styles. 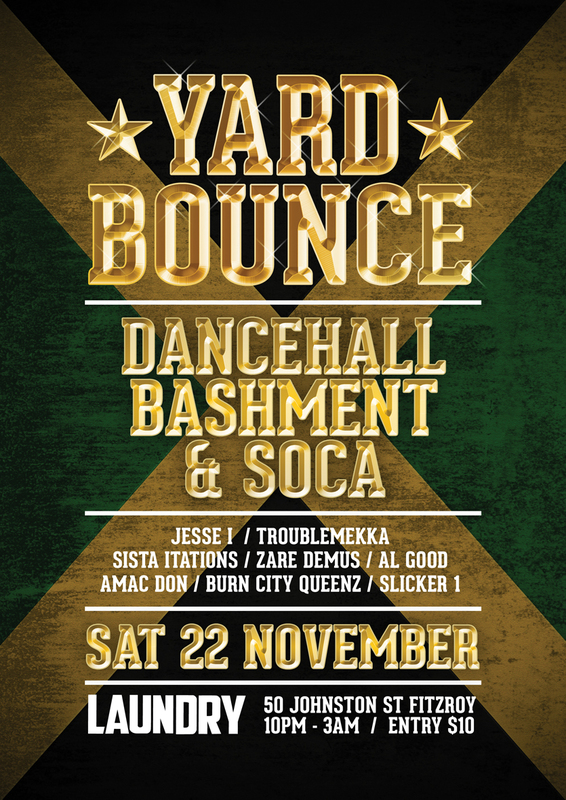 Yard Bounce takes place on Saturday 22nd November at Laundry (50 Johnston St, Fitzroy). $10 door pressure. 10pm-3am.